Shields, Jewlery, Artifacts . . . The power of metal to be formed into intricate patterns and last for centuries gives us a unique opportunity to experience the weapons, jewelry, and ceremonial objects that brought joy and awe to the lives of our ancestors. In burial mounds and in caches hidden from marauding invaders, these objects of beauty and exquisite craftsmanship lie waiting to reveal their splendor. When found, they become museum exhibits that inspire cultural pride and wonder. Using these artifacts to develop custom tattoos is a way to bring them back to life, affirming the aesthetics of the past and creating the designs anew in skin. 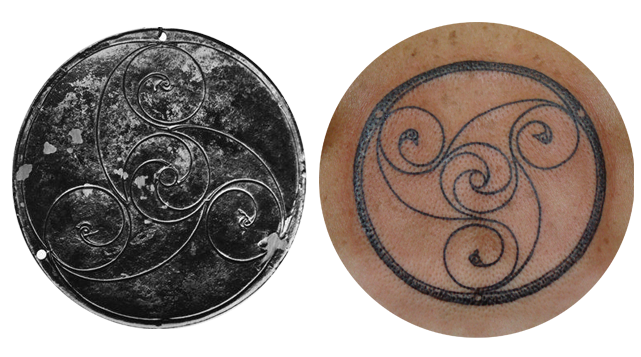 Read on to see specific examples of Celtic Tattoos inspired by these wonderful pieces of history. The Bann Disc is one of the most outstanding pieces of metalwork surviving from the Irish Iron Age. Its graceful spirals and clean lines translate readily into a unique Celtic Tattoo. "In March 1939 while the dredging of the River Bann was being carried out just south of Coleraine, a decorated bronze disc was found near Loughan Island, Co. Derry just above Loughan Graveyard in the sand and gravel near the east bank of the river. The small bronze disc is slightly convex and measures just 10.6 cm across. The decoration consists of a swirling triskele surrounding a circle and within a circle and the design is executed with a number of trumpet-shaped curves with three stylised bird heads. The decoration is slightly raised from the surface of the disc and was created through the painstaking process of carefully cutting down the background to leave the lines in low relief. The disc has three perforations for suspension with a surviving loop of bronze in one. On stylistic grounds it is dated to the first century AD." A historically savvy client commisioned this tattoo based on a gilded "bird of prey" emblem from the great shield of the famous Sutton Hoo burial. "In the 7th century AD, a King - it was surely no less - received a magnificent burial at Sutton Hoo, in East Anglia. A ship was hauled up from the river, a burial chamber was erected in the middle of it, and a stupendous collection of magnificent objects - gold and silver brooches and dishes, the sword of state, drinking horns and a lyre - was set in the burial chamber. Fortunately, grave robbers never discovered the tomb, until in 1939 archaeologists stumbled upon what is still the greatest 'treasure' ever discovered in this country. The great shield was found up against the wall of the burial chamber. The actual shield seen here is a reconstruction; however the central boss, and the various strips of metal that decorated the shield, are the originals." The Tara Brooch, crafted around 700 AD, is a stunning example of Irish Insular Art. Rediscovered in 1850, it was sold to a dealer who gave it the name to increase its resale value. The piece itself has no actual connection to The Hill of Tara. It was likely made for a wealthy patron to indicate status. The brooch is made of gold, silver, copper, amber, and glass. Filligree details include animal heads and intricate knotwork. While more than fifty such brooches have now been discovered, this one is among the most spectacular. If, after reading through this page, you are inclined to get your own Celtic tattoo, please consider MAKING AN APPOINTMENT with Pat Fish. If you are unable to make it to Santa Barbara, you can browse a further selection of Celtic Tattoo Flash in the LuckyFish Art Store. But of course Dervla the Irish Wolfhound encourages you to come to Santa Barbara and run the beach with the Big Dogs!